Yesterday, I wrote about Putin and the task of controlling the regional power. An article in today’s Kommersant gives a picture of one of the methods the Kremlin is using to not only combat political opposition to its rule, but to combat corruption and oppositionists within United Russia itself. However, while this may be the end, the means hark back to both a Soviet past and the timelessness of generational conflict. But others contend that there is no conflict between United Russia and Molodaia gvardiia. One representative from United Russia told Kommersant that “that United Russia was prepared to deal with internal corruption itself” and that the group was a good idea because “they could help us.” Others, like political analysis Stanislav Belskovskii see the youth group as a means to pit the young idealists against the entrenched old guard as a way to wage internal party struggles within United Russia. “In the upcoming elections in 2007, Molodaia gvardiia by its own initiative will search for enemies of Putin and possibly will be used to struggle against competitors of United Russia, with Party life first of all,” Belskovskii told Kommersant. Conforming to the Party line might just be the task. In February, members of Molodaia gvardiia demanded the resignation the governor of Perm for aiding fascists by being lax support to antifascist efforts in the region. Observers then noticed that the apparent call from below coincided with the Kremlin’s desire to clamp down on the governor. The Light Cavalry was more than simple “shock force” against poor accounting and bureaucrats. Their “raids” on Soviet institutions also incorporated class politics. Cavalristy routinely denounced corrupt Party members, traders, kulaks, and other “alien elements” they found in factories and shops. In addition, the military rhetoric of the Light Calvary should not be overlooked. Their penchant for military metaphors was part of a general cultural trends in the late 1920s, when Komsomols spoke of their activism in terms of armies, soldiers, campaigns, raids, scouts, fronts, fights, and battles. These expressions symbolized the attempt by a generation to memorialize a civil war that had preceded them by ten years. Update: There is another, perhaps more important Soviet connection to Putin’s Molodaia gvardiia. 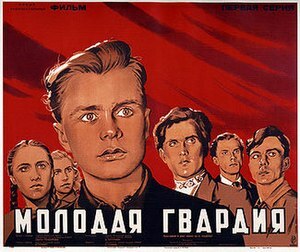 Molodaia gvardiia was also an Komsomol underground anti-fascist partisan group formed in 1942 after the Nazis occupied Krasnodon. Their existance and membership was revealed to the Nazis by turncoats in the groups. In Janurary 1943, the Nazis began arrests of its 80 or so members. Only eleven members escaped capture. All seventy arrested were tortured and thrown to their death in Coal Mine No. 5. Its leaders Oleg Koshevoy, Lyubov Shevtsova, Viktor Subbotin, Dmitry Ogurtsov, Sergei Ostapenkov were shot the next month in the town of Rovenki, only five days before the Red Army liberated it on Feburary 14, 1943. The Soviet novelist Alexsandr Fadeyev wrote a novel called Molodaia gvardiia commemorating its underground activities. Of all the Soviet connections cited above, I now think that this is the memory the Putin group is hoping to tap–a patriotic youth organization committed to fighting fascism and enemies of the state.